For more info on the vowel "IJ" see "Why the IJ?" 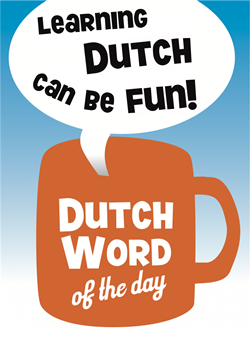 "IJsje" is the diminutive of "ijs", which translates to either "ice" (as in frozen water) or "ice cream" (as in the delicacy). An "IJsje" can be used for a hand held ice cream in a cone (like a vanilla ice cream) or a pop sicle (a frozen lolly of flavored water), which in Dutch is also called a "waterijsje". – "Mam, mag ik een ijsje?" – "Omdat het vandaag zo warm is, trakteert Frank op een ijsje!" – "Hoeveel bollen neem jij in je hoorntje?" – "Nou, ik heb liever een waterijsje." We’ve already mentioned it in one of our early DWOTDs: Holland’s most popular ice lolly is the "Raket". Apparently, it has been around since 1962! It has (somewhat 🙂 ) the shape of a rocket, and consists of three flavors of water ice, which each have a different color. From top to bottom: red strawberry, orange orange, and yellow pineapple, as you can see in the picture. In North America we have a popcicle with a similar shape. The colors are red (cherry) white(lemon) blue(vanilla).